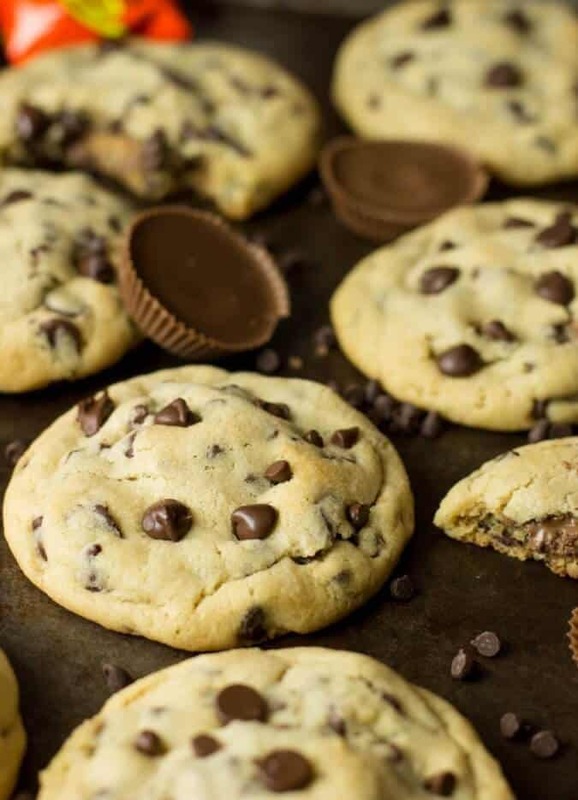 Peanut butter infused chocolate chip cookies stuffed with Reese’s Peanut Butter Cups! A great way to use up any leftover Halloween candy. I think this is the first year in 26 years that I won’t be dressing up for Halloween. I have no costume, and no plans for one, because I’m not going anywhere except outside on my porch to hand out candy bars (Zach is adamant that we hand out only full-size candy bars, so we get to be *that* house). I am dressing up Leia with a headband fixed with a pair of Princess Leia hair buns (because it’s only fitting, right) but I expect those to last all of 5 seconds before she makes a chew toy out of them. So, while I’m not being super festive in the costume department, I am dressing up a whole pile of Reese’s peanut butter cups in soft, peanut butter tinged chocolate chip cookie disguises. In my tradition of stuffing desserts inside other desserts, I hid full-sized Reese’s cups inside each and every one of these cookies. 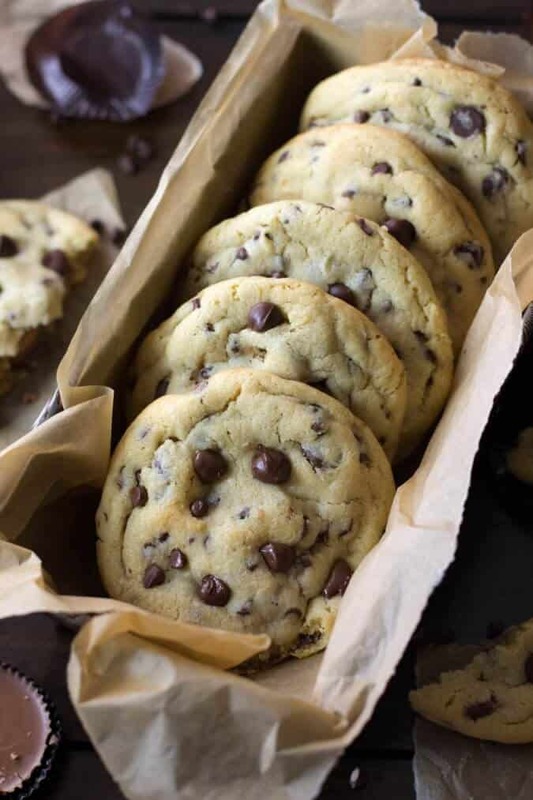 Unassuming on the outside (they just look like freaking fantastic chocolate chip cookies, right?) but loaded with peanut butter chocolate gold mines on the inside. They’re also a great way to use up leftover Halloween candy (OK, I have no idea if “leftover” Halloween candy is really a thing that happens to people and has to be dealt with, but I’ve heard rumors). 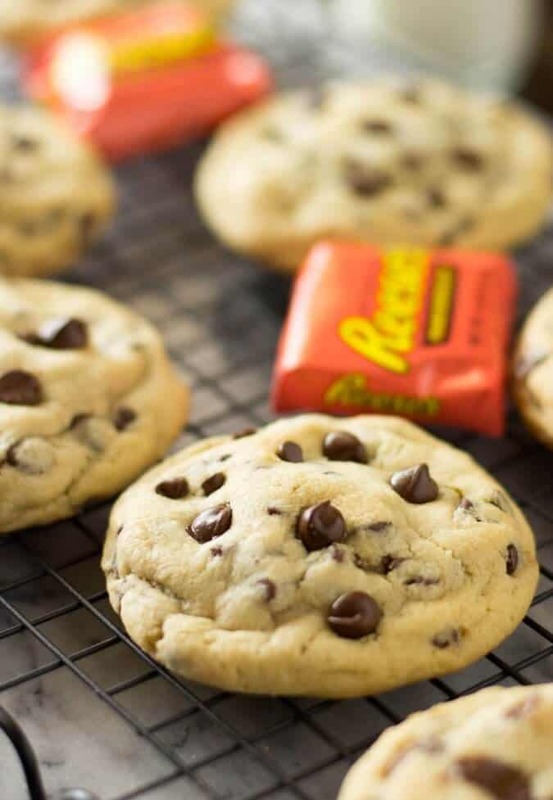 I also dressed up these cookies by adding just a small amount of peanut butter right into the dough itself; since the cookie is a fair bit larger than the actual Reese’s cup I wanted you to have that peanut butter and chocolate taste in every. single. bite. 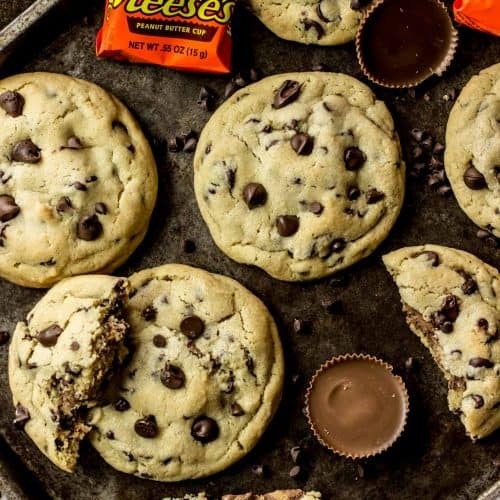 There’s a little bit of chilling time involved, but making and stuffing these cookies is easy — just freeze the Reese’s cups first to make sure they don’t break while you’re piling cookie dough around them. I’m actually working on a short and fast little video that shows exactly how to make them — I’ll be sharing it on Facebook later in the week. And PS I would really love to hear what you are being for Halloween! 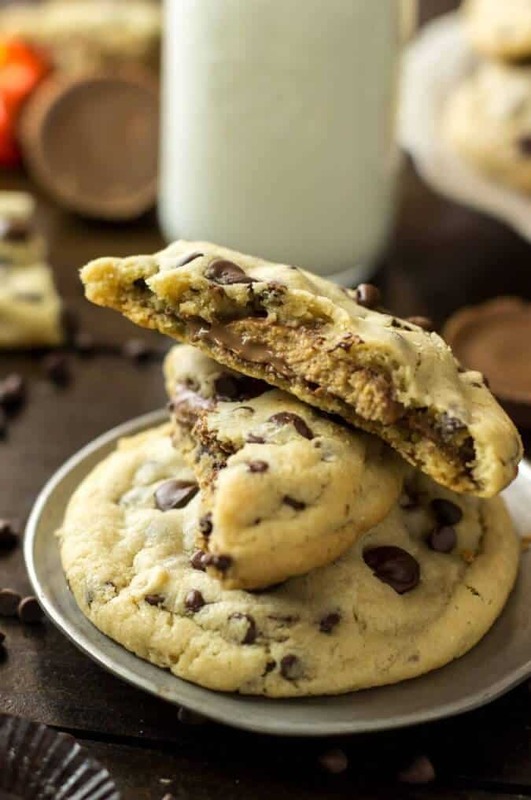 Chocolate chip cookies with a slight peanut butter flavor stuffed full of peanut butter cups -- these are a great way to use up leftover Halloween candy! 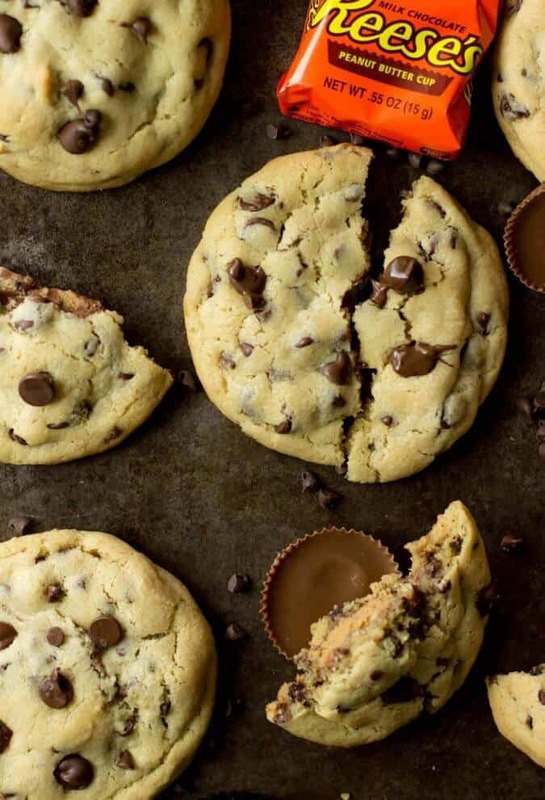 Place your Reese's Cups in the freezer so that they will harden and be easy to stuff in the cookie dough. In the bowl of a stand mixer (or in large bowl using electrical mixer), cream together butter, peanut butter, and sugars until light and fluffy. Scrape sides of bowl. Add eggs and vanilla extract. Beat until well-combined (again, pause to scrape down the sides of bowl, as needed). Gradually add flour mixture to batter while stirring on low speed until completely combined. Place dough in refrigerator to chill 15-30 minutes (if dough is too sticky at 15 minutes, allow it to chill longer, it should be soft and pliable, but not messy). Remove chilled dough from fridge and Reese's cups from freezer. Remove peanut butter cups from their wrappers. Scoop dough by heaping 1 1/2 Tbs'-sized spoonful and press peanut butter cup sideways into the center. Scoop more dough, as needed, and form around peanut butter cup until it is completely concealed. Roll into round ball and place on a wax-paper lined plate or tray. Return cookie dough balls to refrigerator for 15 minutes. Preheat oven to 375F (190C) and line cookie sheets with parchment paper. Place cookie dough balls at least 2" apart on cookie sheet and bake on 375 (190C) for 14 minutes, or until edges are just beginning to turn golden brown. Allow cookies to cool completely on cookie sheet (they will be very fragile when hot) before serving. Enjoy! I made these cookies for my second time baking, after the Easy Brownies from Scratch recipe, and they were absolutely delicious. My whole family loved them. Great recipe! We have made these twice now and everyone loves them! New favorite cookie for sure. Made these the other day. They were so good! 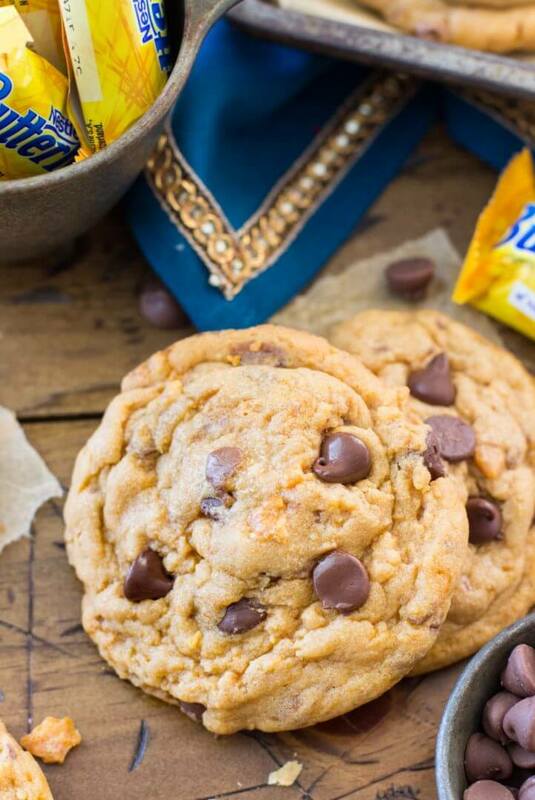 Peanut butter cup inside the cookie = mind blown!! Family loved them. These were delicious! Great recipe! These turned out perfect and looked just like the picture( not always an easy thing to do). 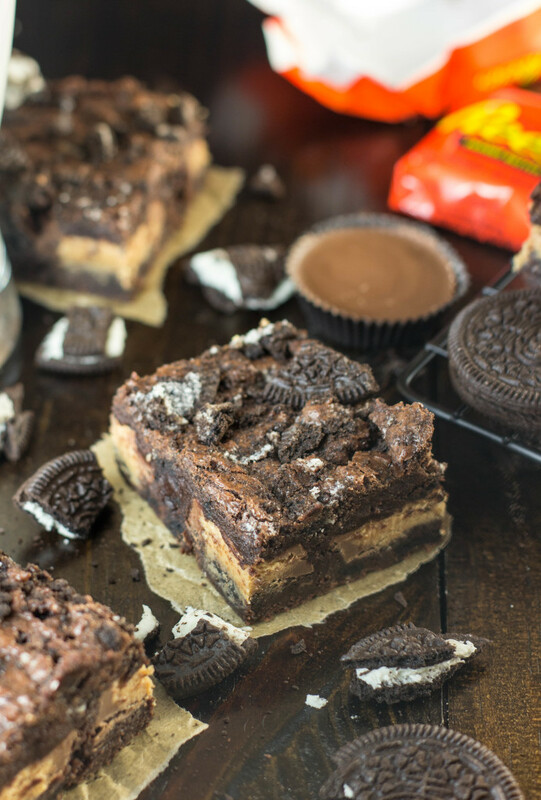 Think these would work with the smaller Reese’s cups so that the cookies aren’t so big? I haven’t tried them that way but I definitely think it would work. The cookies will need to bake for less time, though. 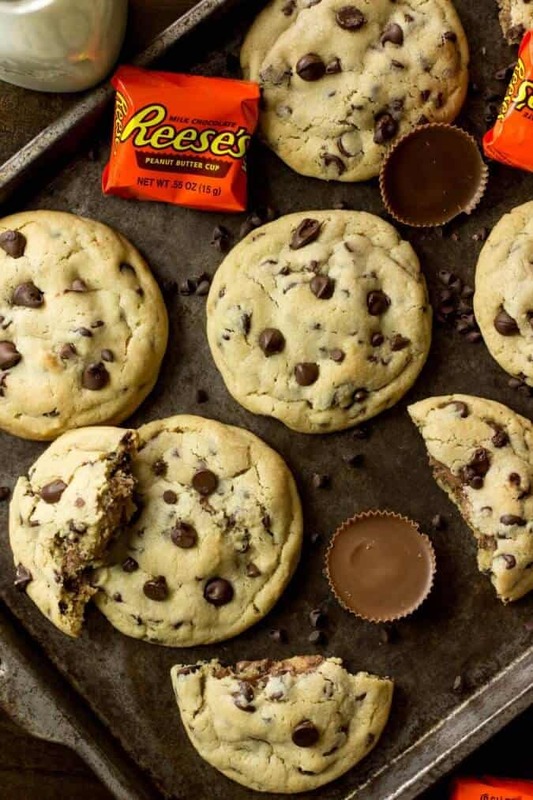 I haven’t tried the recipe, but had wondered about the idea of using the mini reese’s and making smaller cookies. Have you tried this? If so, how did it work? I haven’t tried this but I think it would work, I would bake the cookies for less time, though. These look amazing. I was wondering about how long do you leave them on the cookie sheet to cool? Really interested in the recipe for the Reeses filled chocolate chip cookies. However, I don’t tweet, google, pin or any of the other things. My printer is not working currently, so I would love it if you could add the icon….to e-mail your recipes. That will give me quick easy access to the recipe, instead of having to search for it on facebook, or whatever. Anxious to try them as my family is cookoo for Reeses ! LOL. Thank you for your help ! is there a substitute for the cornstarch? If you don’t have it, you can just leave it out. It makes the cookies softer but you’ll be OK without it. Hope that helps! Kids will love these! Great photography as well. I think I just died and went to dessert heaven. LOVE. Yum, Yum, Yum! 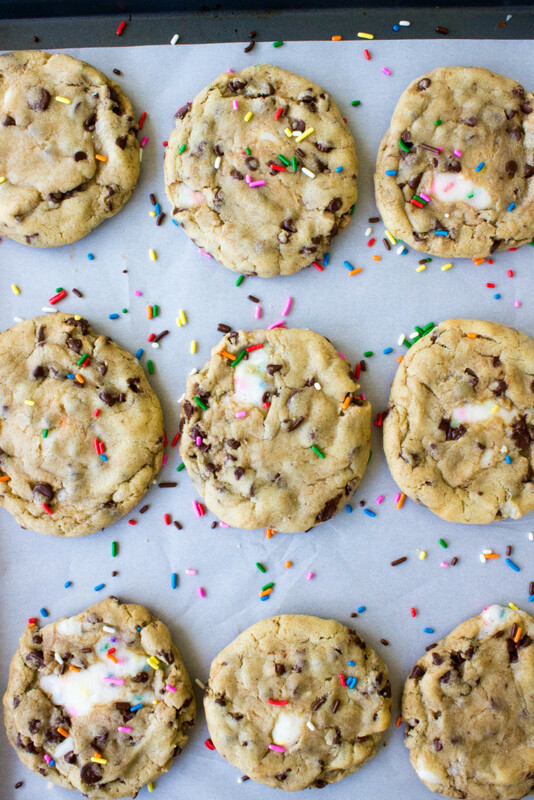 These look like my perfect cookie! Took these to work today and they were snatched up in a heartbeat. They were great. Thanks.